At the end of XIX century Pamplona was a small town ready to grow. The economy was boosting. Modern times were coming. New ideas spread around Europe. It was the moment to watch and to be watched. This is the moment when fancy cafés around Europe were created as a place to gather, talk and why not, gossip. This is the moment when Café Iruña was openned. In 1888, one of this cafés opened in Pamplona, it was Café Iruña. Pamplona’s oldest and fanciest café.Overlooking our main square “Plaza del Castillo”. It opened the day we got electrical light for the first time in town. This is the reason why all the decorations are hundred of lamps and the walls are covered with mirrors. They wanted to show modernity, that at that moment was the light. To do so they invited everybody to come and see the light. The turned off all the street gas lights and suddenly the turned on the electrical light. It was so bright, so new and I guess we were so rural that, people run away screaming that that light was evil. After the first shock everybody learnt how to love Café Iruña. When I say everybody I mean it, I really mean it. People like Ava Gadner, Charles Chaplin and of course Ernest Hemingway loved it. 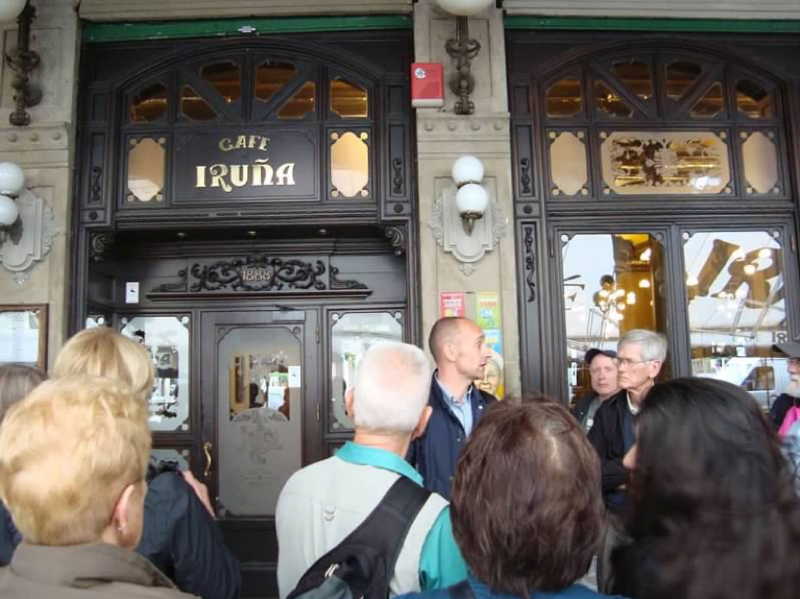 In fact Ernest loved it so much that all the characters in his first novel ¨The sun also rises¨ party at this café, and thanks to him, Café Iruña is world famous. For us now, it is a heritage building, so the owners are not allowed to change the décor. But it is also the place when we get together and have a coffee or a wine during the year and during the week of San Fermin it is a great place to party. I personally love, when I am exhausted during this week sitting there or in their terrace and have a “café con leche” and do some people watching. Check that in the arcades around in the square, all the pillars are squared except the one that is rigth at the entrance of Café Iruña that is round. One more thing, the name Iruña is the basque name for Pamplona. I LOVE CAFE IRUÑAIf you want to learn more about Pamplona´s history and traditions, follow this link and book now a Pamplona city tour, you will learn all about my hometown.